This Denim Assorted Print Wrap Maxi Dress with Bell Sleeves can be worn for any occasion. 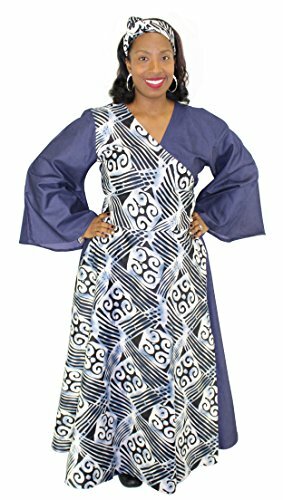 Featuring stylish African prints on the front with a matching headwrap, this dress brings back your culture in a modern era. The bell sleeves provide an elegant flair, along with the wrap waist which accentuates your waist line for a more flattering look.